Introduction to tallgrass prairie. It reads as a book of tales circling round the first introduction as well as the continuation of human interaction among prairies. Diving into its detailed geography such as the types of plants, animal, and weather that occur there. 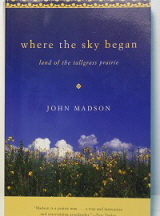 This book has sparked the interest in prairie restoration for many people and organizations. It serves as inspiration to those just learning about the heartland’s native landscape and to rekindle the passion of longtime prairie enthusiasts.